There would be the ring of the till, the romance of communications and industry. Young men were happier even then lying in the long grass and waiting for the hooks of young girls to come down; God in thigh-length boots like a woman. But this was no answer to the population problem; worms propagate in geometrical progression. All the young men still had to line up on the platform. 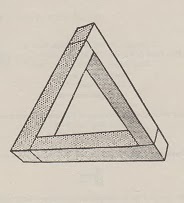 -- and that this represents the triangular nature of all love relationships, not just the ones involving three people. This is the book I think should have won the Booker Prize in its day (1969 – see blog entries here and here) and it is a perfect novel, and one of the best I’ve read in years. It has a lot of detail from the 1960s, but still reads as very fresh and modern. It’s a book that is now only published by a small reprint press, but really should be better known: should have won, should be a small modern classic. This section is from the difficult linking sections: there are eight narrative pieces, something like short stories, connected by dream-like hallucinatory pages. But don’t be put off – push on through. In its compellingness and readability, and its story of posh men going off the rails, it reminded me of the work of Edward St Aubyn. Also proving that we haven’t yet found a book where we can’t drag the Mitford sisters into the discussion: Nicholas Mosley was the son of Blackshirt leader Oswald Mosley, and so the stepson of Diana Mitford. John Frankenheimer made a film of Impossible Object in 1973, starring Alan Bates, but apparently it barely had any cinematic release, and is very hard to get hold of. You can read a fascinating interview with Mosley here. The picture is an Allen Jones untitled artwork held at the Tate Gallery. Moira - I have to say that the first thing that struck me about this post is that pair of boots! Really appropriate for the post - an excellent choice - but not something I think I'd choose... It's interesting isn't it how these wonderful novels that truly give readers a look at real life don't get the 'press' they deserve. And I like the idea of linked stories. Intriguing when it's done well. It's quite the picture/artwork isn't it? And yes, this a book really worth reviving, it should be better-known. I have absolutely no knowledge of this author or the book (other than from your blog). Still sounds very complex, maybe too complex for me, but I love that triangle, so maybe someday I will push my boundaries and try it. Very interesting lineage he had, and the interview was useful to get more of a picture of him as a person. I'm so glad you went and looked Tracy - I thought it was really interesting and helpful. He does sound such an interesting person with such a fascinating background.